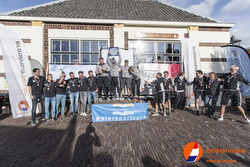 (Veere, The Netherlands)- For the third time in a row, Almere Centraal became the Dutch champion of the Eredivisie Sailing. The pretty Veerse Meer in Zeeland was the playing field of a three-day battle for the coveted national title. WV De Meeuwen (Leeuwarden) was able to take a surprisingly fast start to the 2nd place thanks to the nice and constant results this weekend. With only 3 points away, RR & ZV Maas & Roer (Roermond) took third place. This last round was an important moment for many teams and it was a weekend where nothing turned out to be certain. This year, the sailors were treated to wind speeds varying from 2 to 16 knots over the weekend. On Friday, the spectacle on the water was very easy to follow from the quay in Veere; thanks to the wind direction, there was literally a front seat on the harbor to watch the action. In addition to the individual rounds of play earlier this year, the winner of the general classification was also determined in Veere. Gaining a top 4 place in the general classification means a coveted start ticket for the semi-finals of the international Sailing Champions League in 2019. 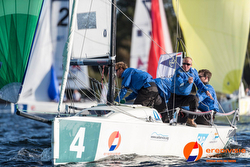 In the 2018 SCL Finals in September, three Dutch teams sailed on the mountain lake St. Moritz, Switzerland. Almere Centraal won the national championship for the 3rd time with a total of only 105 points. The winning team captain, John den Engelsman, commented, ”we have actually done everything we always do; good preparation, neatly mastered, do not take too many risks. As a result, we have been able to further expand our lead. The circumstances were not easy, but by paying attention to our opponents and the wind shifts, we were able to make it happen. We just have a good and reliable team that wants to train. In addition, we have often sailed the Champions League, where you learn a lot. If we can form a permanent crew, we participate and we go for a podium place". In Veere, Almere Central managed to win 11 of 15 races in the regatta! WV De Meeuwen won the silver. Their team captain explained, “despite the tension, we have managed to perform well. Actually, we climbed up the leaderboard the whole year, from eighth place after the first round to the second in the last one. Yesterday, we had a small dip and we had a backlog on our competitors. But, fortunately we knew how to recover and on Sunday we started very motivated. This was reflected in our good performance and we have been able to realize our main goal; participate in the Sailing Champions League! That we also could also get silver is, of course, absolutely fantastic. Next year we will go for gold!" For more Dutch J/70 Sailing League information Add to Flipboard Magazine.